Control your camera's pan and tilt remotely with this Motorized Pan & Tilt Head Kit from Bescor. 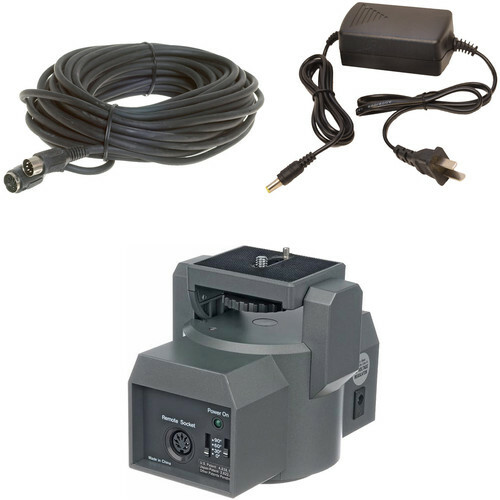 This kit includes the MP-101 Motorized Pan & Tilt Head, a PS-260 AC power supply, a remote control, and a 50' remote extension cable. The MP-101 mounts between your tripod and camera, supports up to 6 lb payloads, and can pan and tilt at adjustable speeds. The remote control allows you to control the head from 50' away thanks to the included remote extension cable. The included AC power supply allows you to power the head when mains power is available, or you can power it with separately available Bescor 90-645 or AA batteries. The Bescor MP-101 Motorized Pan & Tilt Head attaches between a tripod and camera and enables remote panning and tilting of the camera. Two independent motors smoothly operate horizontal and vertical motion at adjustable speeds. The head supports payloads up to 6 lb. The two mounting points are the 1/4"-20 tripod threads underneath and the 1/4"-20 camera mounting screw with registration pin on top. All tripods and cameras are compatible. An Auto Pan Mode allows for continuous panning motion, and a switch selector lets you assign end points at 45°, 90°, or 340°. The maximum horizontal angle is ±170 degrees, and the maximum vertical angle is ±15 degrees. This head can be powered by four AA batteries, the Bescor PS-260 AC power supply, or a Bescor 90-645 external battery, all sold separately. The Bescor RE-50 extension affords 50' (15.24 m) of additional separation from the MP-101 remote pan head to its remote control. The Bescor PS-260 AC Power Supply for MP-101 Motorized Pan Head features a 120-240VAC, 60/50Hz input and 6VDC, 700mA output. It can be used worldwide with an appropriate adapter, sold separately. Box Dimensions (LxWxH) 6.4 x 5.8 x 4.4"
Box Dimensions (LxWxH) 6.4 x 5.8 x 2.55"
Box Dimensions (LxWxH) 4.95 x 2.9 x 2.3"